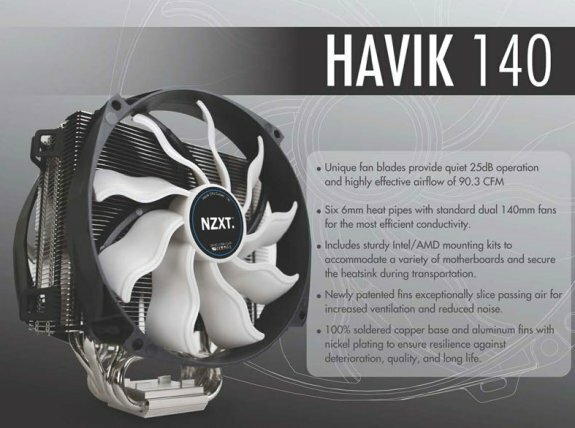 NZXT shows off its new Havik 140 processor cooler. It offers a nickel-plated copper base, six 6mm heatpipes and two 140mm fans. NZXT, a company built on realizing the dreams of gamers worldwide, is proud to announce HAVIK 140, a high-performance CPU cooler comprised of 6 mm heat pipes, dual standard 140mm fans and expertly engineered fan blades that deliver unparalleled cooling performance. HAVIK 140’s fan blades are designed to slice through the air with ease, maximizing ventilation (90.3 CFM) at drastically reduced noise levels (25db). Its small form factor eliminates strain on the motherboard and leaves ample room within the case to facilitate a masterfully clean build. NZXT selected top of the line premium components that are built to last with 100% soldered copper base, aluminum fins, and a nickel plating to ensure resilience for the long haul. HAVIK 140 is universally compatible with Intel and AMD processors and is available now for $74.99 (€69.99).